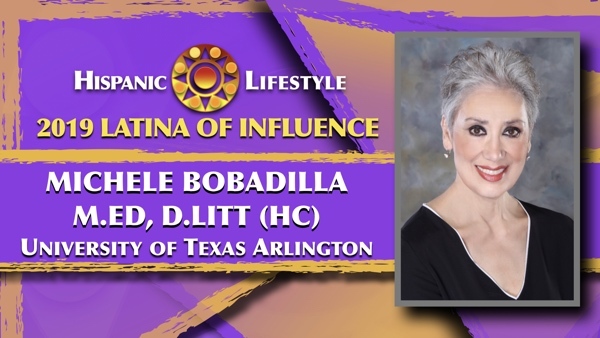 Hispanic Lifestyle is pleased to recognize Michele Bobadilla M.Ed, D.Litt (hc) Assistant Provost for Hispanic Student Success and Senior Associate VP for Outreach Services and Community Engagement at The University of Texas at Arlington as a 2019 Latina of Influence. Ms. Bobadilla along with our entire list of 2019 Latinas of Influence are invited to participate in Latina Conference 2019 taking place April 10 and 11, 2019 in Ontario, California. Michele Bobadilla is a distinguished state and national Latina educational leader in the student access and success space. Michele Bobadilla is an educator, advocate, and mentor who uses her voice and seat at the table to serve as a catalyst for change. Michele Bobadilla’s outreach and community engagement partnerships have been recognized as transforming the NTX educational landscape for first- and second-generation students and their families. Next2019 Latina of Influence Domenica Escatel | Founder Chicana Inc.